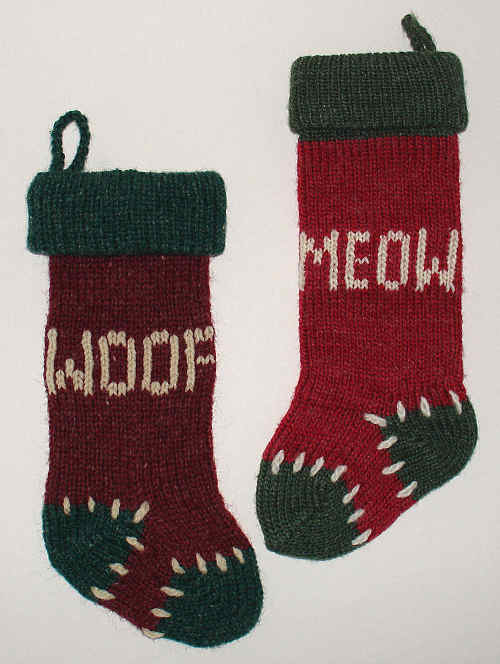 Here are examples of custom Christmas stockings that I've knit without pictures on them. Sometimes less is more! 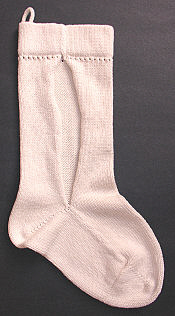 There is so much ornamentation during the Christmas season that a very simple stocking is often more noticeable. These stockings can be smooth, or textured patterns can be worked into them. Overall geometric patterns or stripes are also very nice. 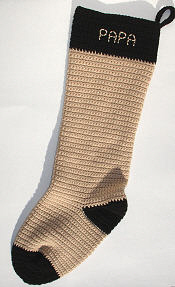 Please look to see what Customers Say about stockings I've knit without pictures. 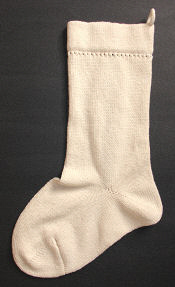 This is a duplicate of an existing family stocking. Very simple, but very effective. A name could be added to the top if desired. A mother sent me a photo and measurements of a stocking her grandmother had made her 30 years earlier. I duplicated the design for other members of her family. I love the non-traditional colors, which are especially beautiful in wool. Another stocking in the same set. This is a very nice shade of gold. More stockings in the same set. These are in classic Christmas colors. Vertical names are a bit unusual on stockings, but they're especially nice on a plain stocking. Here, the contrast stripe just below the top ribbing really sets off the name and the pair of tiny bells. 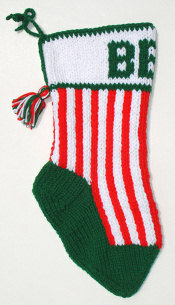 This is the same design as the previous stocking, but with the colors reversed. 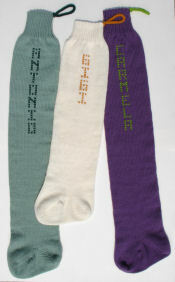 These three stockings are a traditional family design. They are knitted with very bulky yarn, so are thicker and heavier than most. However, they're also shorter than most. I haven't seen this design anywhere else. The same vertical stripes, but quite a different look with the colors reversed. The diagonal-stripe version of this family's stockings makes me think of candy canes, obviously! It also looks good with green and white stripes. A very simple but effective design, similar to the style of socks seen in the Red Sox logo. This a very simple design knitted from a pattern provided by the customer. She ordered several, which she then embellished to personalize them for each grandchild. This stocking was knit to match the father's, who had sent me a photograph and measurements. This is another design that was duplicated from a photo and measurements. 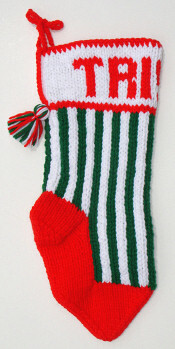 I designed this crocheted stocking based on a verbal description from the customer. She wanted something like what her grandmother had made for her when she was a child. Knitted from a pattern provided by the customer. This textured stocking includes twisted stitches that resemble garlands, and raised stitches that form Christmas trees. The yarn is a wool/acrylic blend. The customer mailed me her MEOW stocking and asked me to create a WOOF stocking like it. Her original pet stocking was purchased, but the company no longer sold the other version. This was for a customer who enjoys embroidery. She requested a blank stocking, from cotton yarn, that she could decorate with stitchery and attached ornaments. She asked me to match the size, shape, and feel of a previous stocking that she sent for me to examine. She also asked for the leg seam to be left open, so she could more easily do the embroidery and fasten off her threads. 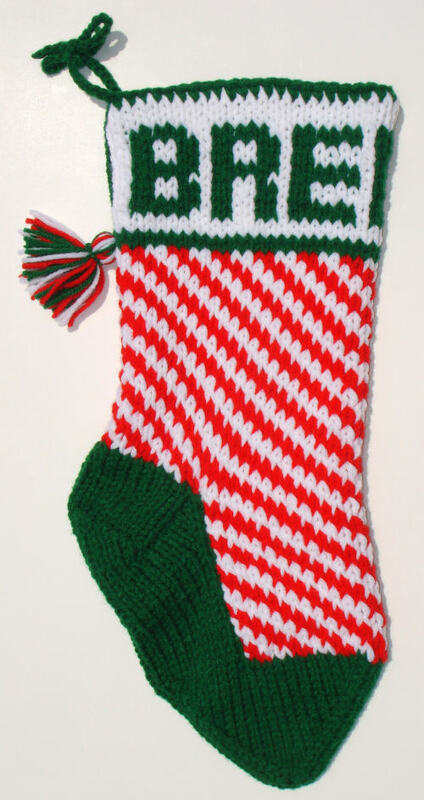 If you're interested in a simple stocking without pictures on it, find out more about ordering custom Christmas stockings. 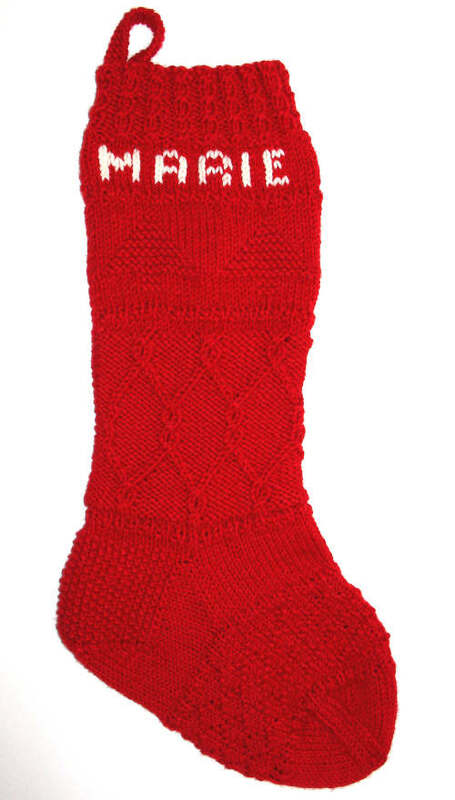 You might also be interested in my Personalized Christmas Stockings.